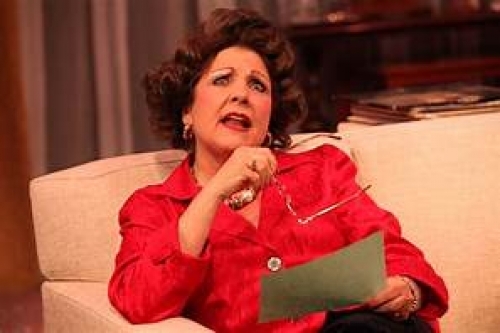 TRAVEL & ENTERTAINMEBNT: CenterREP�s Production of �Shirley Valentine� Gets Better with Age! Then, an out-of-the-blue offer to accompany her best friend Jane on a two-week trip to a Greek island awakens the promise of her unfulfilled dreams of adventure � and a chance to find herself again. She doesn�t tell her husband of the trip for fear that the controlling man will try to talk her out of it. However, she gets up enough nerve to pack her bags and go, tacking up a large piece of paper with huge letters spelling out "Gone to Greece, back in two weeks." Off she goes, leaving her drudgery behind. Act two finds Shirley basking in the sun on the shores of a Greek island. She is extremely happy since she has met a handsome Greek waiter. She admits that she has fallen in love with the idea of living, and she looks younger and more vibrant as she tells the audience about her romantic adventure with the gorgeous waiter. Kerri Shawn gives a compelling performance in this two hour and 30 minute production. Her Liverpool accent is perfect. She is amazing as she unravels Shirley's sexual and social identity. She does a convincing job of talking about the characters, using the speech of kids, her friend Marjorie, and even a braggart neighbor whom she cannot stand. Shawn is mesmerizing and keeps the audience fascinated as Shirley seeks to fulfill life. �Shirley Valentine� has a universal appeal that sends a one-of-a-kind message that resonates everywhere. For tickets or more information please phone (925) 943-7469 or visit www.CenterREP.org. You can also visit the LCA Ticket Office at 1601 Civic Drive or the Ticket Office Outlet at the Downtown Walnut Creek Library.